The Best Tomato Harvest For Years! I don’t know exactly what I have done differently, this year. The tomato harvest has been as good as any I can remember. I have the usual five or so varieties, I use a good tomato feed once a week and I also use the ‘old ways’ of putting my used banana skins in the pots. Almost all the fruits have gone a glorious deep red and taste sweet, and the few remaining show no sign of not following suit. We appear to be getting as many tomatoes as in the photo below every one or two days! 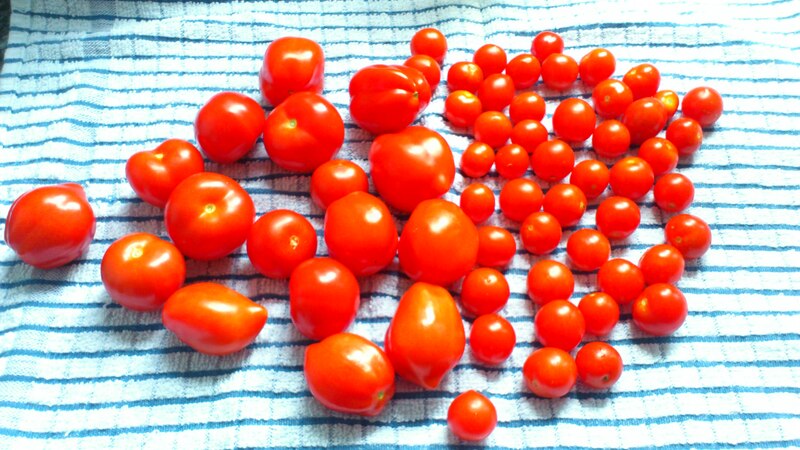 We have made soup, passata and enjoyed many as salad fruits. About half have also been tightly wrapped in freezer bags and stored in the deep freeze for use in stews, soups etc during the barren winter months. This entry was posted in The 'Urban Farm' and tagged aftercare, banana skin, feed, fruit, fruits, harvest, storing, tomato, tomatoes. Bookmark the permalink. 1 Response to The Best Tomato Harvest For Years! It’s been a terrific year for tomatoes here in Madison, too. What a harvest! The first frost is near, I’m sure, and the vines are still covered with green fruit.